Welcome, I'm Matthew Watts the Halifax Piano teacher. I offer piano lessons in the Halifax, Sowerby Bridge, Mythomroyd and Hebden Bridge area. throughout Calderdale; Halifax, Mythomroyd, Luddenden, Hebden Bridge, Howarth, Brighouse and Bradford. I teach practical music and theory for grades 1- 8 and diplomas. Teaching technique, posture, sight reading, scales and Hanon exercises. As well as working towards ABRSM grade 1-8 exams and Diploma level (DipABRSM) I also teach students to read their favourite classical pieces for a lifetime of piano enjoyment. There is very little written music in this type of learning. The basics involve learning the blues scales and simple chord progressions. After only a handful of lessons students are able to play their own little inventions based on the material I give them. Many students like to play pop / rock songs as well as classical music. I am able to provide sheet music tailored to a student’s ability and also can teach music by ear or chord symbols. I also teach people how to adapt music written for a full band to solo piano. With this students can learn how to play anything. With more than 12 years of teaching experience I enjoy inspiring others to play all genres of music. I hold a degree in classical music from Leeds University and two ABRSM diplomas. Find out more about my experience and specialisms on my “piano lessons” page. “My piano lessons with Matthew are a delight. 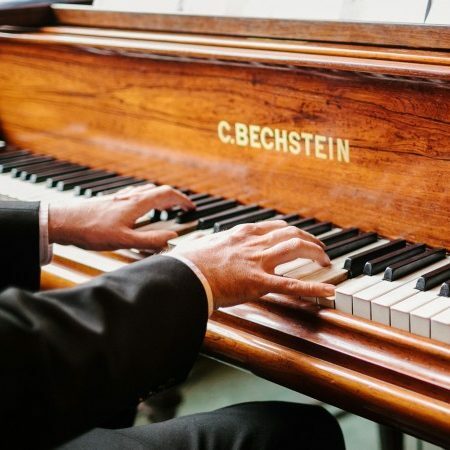 We cover classical music as well as blues and jazz and my favourite, the standards of Gershwin and we tackle all of these topics from reading sheet music as well as from listening and learning chords and improvisation. Matthew also persuaded me to prepare for the RSM exams so now I am the proud possessor of both Grade 5 practical and theory certificates and am preparing for Grade 6. Now a parent of four children who all liked to ‘tinkle’ on the piano at home, I needed to find a piano teacher. Finding Matthew Watts was, quite simply, a stroke of good fortune. I honestly thought that the kids would, as so many do, attend a few lessons only to decide that they wanted to drop piano in favour of some other hobby, how wrong I was! Three years on, three of our four children are still actively playing and not only that – their interest and determination to succeed just keeps on growing!